We writers talk a lot about word count and goals and writing every day. But have you ever actually sat down and written down daily goals? Let me back up a minute. Even on a contracted deadline, having an overall goal—and writing it down—is a good idea. 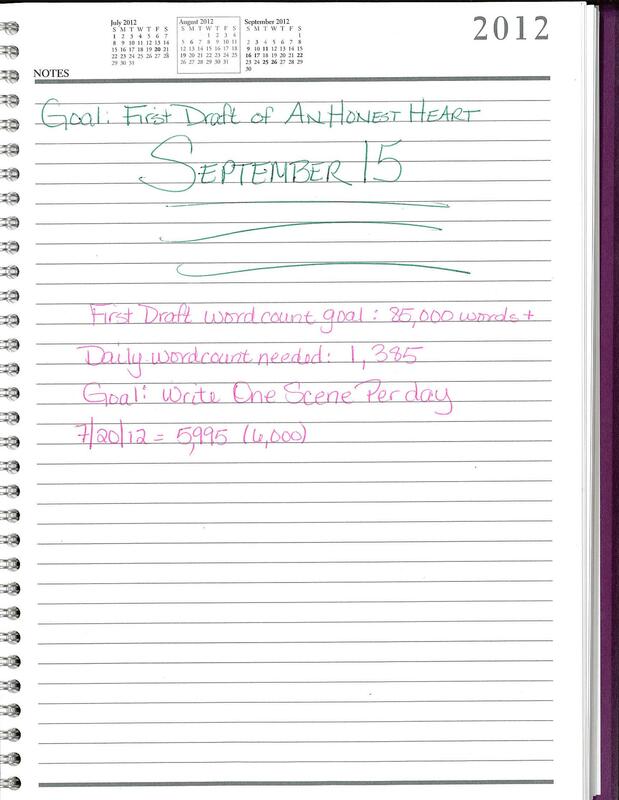 Friday, I sat down with my planner and set myself a goal of having the first draft of An Honest Heart finished on September 15—or, one month prior to the date it’s due to be turned in. Then, based on the current word count (5,995 words) and my word-count goal for the rough draft (85,000+ words), I determined that I would need to write 1,385 words a day to hit that total word-count goal by September 15. 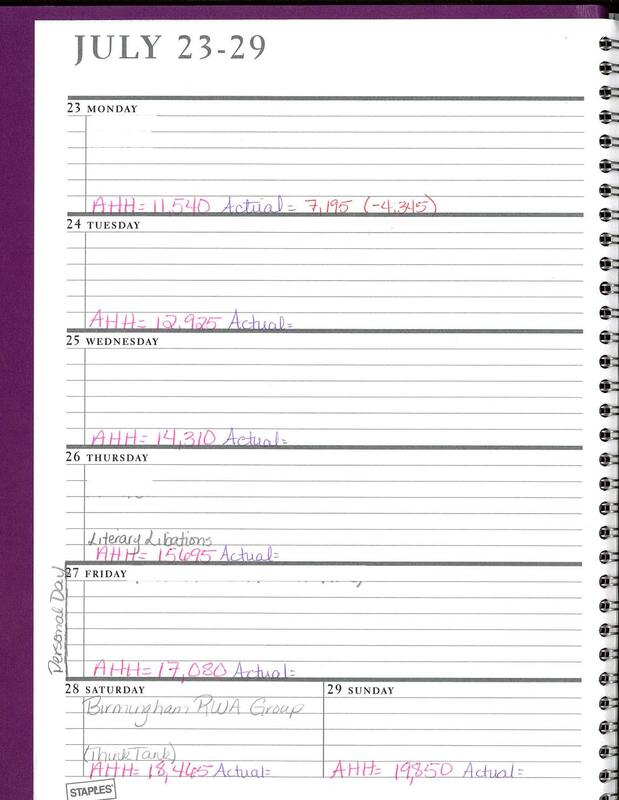 So I went through my planner day by day and wrote down the word count I should be at for each day to meet that September 15 goal. I also made sure that I wasn’t going to ignore those daily goals by making myself write down the actual word count achieved each day. Fortunately, I’m taking a road trip this weekend, albeit a short one. I’m driving down to Birmingham, AL, on Friday to give a workshop to the RWA group down there—a workshop on Plotting for the Seat of the Pants writer. And as it’s one that I’ve done a few times now, that leaves me free to WRITE IN THE CAR going down and coming back. So, not only am I hoping to get caught up to where I should be before I leave on Friday, I’m hoping to be able to get a little bit ahead if at all possible this weekend. Have you ever sat down and made a daily word-count-goal calendar? How do you keep track of your writing goals? How do you keep track of whether or not you’re meeting your word-count goals? I have not tracked word count goals like this. I like how you’ve done this-with what your total count should be on a given day. May have to give this a whirl. I never have. I just try to be as disciplined as I can be, one day at a time, and not give in to my inherent laziness, and stay sensitive to my relationship with the WIP, and with what the Lord might be leading me to do, which sometimes isn’t according to MY plan. I thought I’d blaze through and finish my WIP by the end of the month, but with 4-5 chapters left to write I realized that some serious issues of character development need to be addressed, and became aware a couple days ago of the need to set the project aside for a time to cool off, so I can come at those issues objectively, and with an inspired game plan that I know is right (only time can provide that). I could have just plowed on, but I would have been a frustrated mess by the end of it, and probably would have had to rewrite the ending anyway to fit the changes I know I need to make, so what was the point? No, I haven’t, but I NEED TO!!!!! Never thought of doing writing goals, it’d be good for writing I suppose. Hi, Kaye! There’s a website that’s based on the “morning pages” concept that I find inspirational to keep me on my writing goals: 750words.com. It keeps a daily and cumulative word count, offers language analysis tools, and even gives little “badges” for achieving basis writing goals like 3, 5, 10, 30 & 100 days in a row, but only if you write at least 750 words per day. I’ve written for the last 77 days straight and accumulated over 89,000 words. I’m not writing a novel, and some days I write as a personal journal and some days I write in different character voices or in a narrative mode, but if you signed on with a plan and stuck to it…. And, oh yeah, it’s free! Thirtysomething and Never Been Kissed? Getouttahere! The "Canon" of the Romance Genre?